The Southern Israelite’s Adolph Rosenberg found himself under fire in 1967. 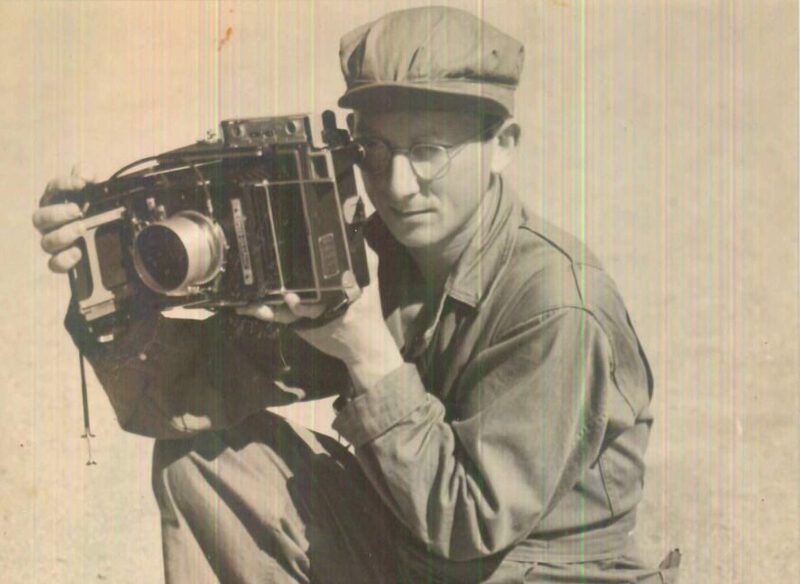 At the age of 55, Adolph Rosenberg found himself playing the impromptu role of war correspondent. 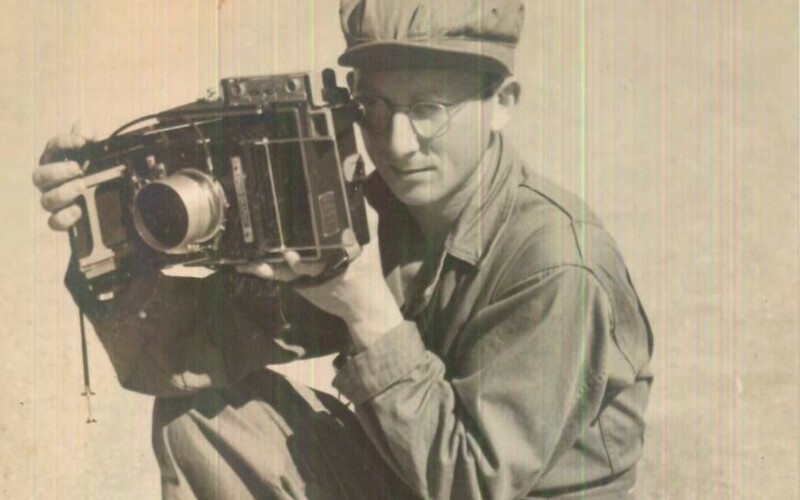 In this photo, a much younger Rosenberg tests out a camera. A small item on the front page of the May 19, 1967, edition of The Southern Israelite (known today as the Atlanta Jewish Times) reported that Editor and Publisher Adolph Rosenberg would lead a delegation of “fifty Jewish newspapermen and their wives” to Israel as guests of the Israeli government. That item also mentioned that Associate Editor Vida Goldgar and her husband were in Europe and would connect with the American Jewish Press Association delegation in Israel. There, the Americans were to hear from government officials, including Prime Minister Levi Eshkol and Jerusalem Mayor Teddy Kollek, and tour the country. The AJPA was gathering in Israel after months of increasing threats, failed U.N.-brokered talks and occasional border skirmishes on the path to what would break out at the Six-Day War on June 5, 1967. “Newsmen Go To Israel Despite Mounting Tension” declared a front-page headline in the May 26 Southern Israelite, despite the urging of the State Department that Americans leave Israel. As president of the AJPA, Rosenberg had scheduled the Israel meeting a year in advance. He could not have envisioned the adventure he would experience. “While there is growing danger, it seems more significant than ever that Jewish newsmen make this trip to indicate their confidence and abiding interest in the Jewish State, that they see with their own eyes how the survivors of the most monumental persecution in man’s history have still to live in the shadow of the threat of death. What a travesty of international justice that Israelis have to eke out their existence literally within sign of undisciplined, savage and maniacal people, sworn to their extinction,” Rosenberg said in an article written before he left but published May 26, after he arrived in Israel. “I was amazed at the thoroughness of the mobilization in Israel,” she said, marveling that when the hourly news report was broadcast on the radio, people stopped whatever they were doing to listen. The AJPA meeting ended, and the delegation returned to the United States. Except for Rosenberg, who had a personal reason for delaying his return. And there was no contact from Rosenberg. The war ended June 10. Rosenberg was able to fly out of Israel and make his way home June 11. On June 12, the Atlanta District of the Zionist Organization of America held an emergency meeting at the Jewish Community Center (then located on Peachtree Street). Rosenberg “was given a standing ovation by those present, who expressed admiration for his courage in remaining in the field of battle even though the State Department had requested all American citizens to return home immediately,” The Southern Israelite reported in its June 23 edition. Rosenberg told his tale in the June 16 edition. “Middle-age is a bit late to become an active war correspondent. But I did. I am a bit too old to skip through the streets of Jerusalem dodging bullets. But I had to. The mid-fifties is a time for comfort and not for spending a night in a shelter to escape falling bombs. But it was necessary,” he wrote. By the time that article had been published in The Southern Israelite, portions had appeared in The Atlanta Journal-Constitution’s predecessors and been distributed to newspapers nationally through The Associated Press, such was the interest in Rosenberg’s first-person accounts. Rosenberg was then 55 years old. The Albany native, who grew up at Temple B’nai Israel, entered journalism through his high school newspaper and graduated from the Henry W. Grady School of Journalism at the University of Georgia. He worked for the Albany Herald, the United States Daily (in Washington), the Carroll County Free Press, and both the Atlanta Constitution and the Atlanta Journal (which later merged) before joining the staff of The Southern Israelite in 1940. Rosenberg became the publisher of The Southern Israelite in 1946 and five years later headed up a corporation that purchased the newspaper. When the war began, Rosenberg did not hole up at his Tel Aviv hotel or Israel’s Government Press Office. He traveled to the front lines. What he saw left an indelible impression on him. Whatever hardships Rosenberg endured, he kept them in perspective. “But no American ever is too old to feel his heart breaking over the sight of a thousand children in the school shelters, courageously keeping up their spirit while outside explode the fearful bombs and mortars from Jordanian fighters and reciprocal Israel positions,” he wrote. Rosenberg wrote prodigiously, articles that carried his byline and others that did not but likely were his work. There were articles he wrote before the war that were not published until after it ended. Rosenberg shared an extra Southern Israelite credential with a friend, Rabbi Emanuel Feldman of Congregation Beth Jacob, who was teaching that year at Bar-Ilan University near Tel Aviv. Rabbi Feldman went to Rosenberg’s hotel, and the publisher gave him the press card, which the rabbi then had stamped by the Government Press Office. “And I became, lo and behold, a war correspondent,” Rabbi Feldman said with a laugh 50 years later as he spoke at Beth Jacob in April. Rabbi Feldman, who now lives in Israel, told the 200-plus people in attendance how, by wielding a credential from Atlanta’s Jewish newspaper, he was able to drive through military checkpoints and be among the earliest nonmilitary personnel to enter the Old City and reach the Western Wall the day after it was liberated by Israeli paratroopers.